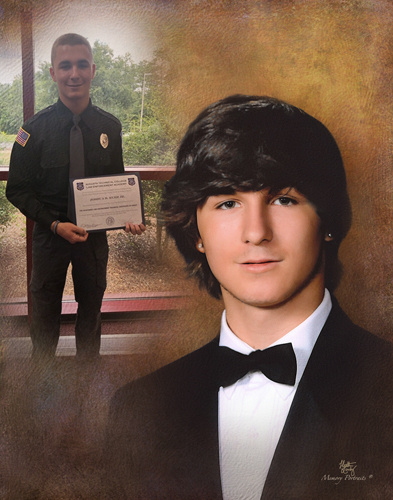 Deputy Joshua “Josh” Bryan Ryer, Jr.
Gibson, GA – Deputy Joshua “Josh” Bryan Ryer, Jr. 19, entered into rest January 29, 2019 while in the line of duty. Deputy Ryer was born in Baltimore, Maryland, but grew up in Columbia County, GA. He was a 2017 graduate of Evans High School and enjoyed soccer, baseball, and hockey. Deputy Ryer graduated from the Augusta Technical College Law Enforcement Academy and was awarded his certification as a Law Enforcement Officer. He was employed as a Deputy Sheriff in the Glascock County Sheriff’s Office. Deputy Ryer attended Journey Community Church in Evans, GA. Survivors include his father, Joshua Ryer, Sr. (Lindsey Norris-Ryer) of Gibson, GA; mother, Sherry Ryer (Shane Kent) of Dearing, GA; sister, Sarah Ryer of Gibson; and grandparents, Bobbie Ryer and Bertha Prince. Funeral services will be held at 3:00 p.m., Sunday, February 3, 2019 in the Glascock County High School Gymnasium with Pastor Bobby Smith officiating. Interment will follow in the Jefferson County Memorial Gardens, Louisville, GA. Honorary pallbearers will be fellow Law Enforcement Officers. The family will receive friends from 4 until 9 p.m. Saturday, February 2, 2019 in the Glascock County High School Gymnasium. In lieu of flowers, donations may be made in memory of Deputy Josh Ryer to the Glascock County Sheriff’s Department, 437 E Main St., Gibson, GA 30810. Beggs Funeral Home, 799 Cobbham Rd., Thomson, GA is honored to serve the family of Deputy Ryer.